Jacket and petticoat of sprig muslin. Regency era costume. Home » Jacket and petticoat of sprig muslin. Regency era costume. Evening Dress. Jacket and petticoat of sprig muslin. March 1795. Heideloff`s Gallery of Fashion. The hair in light curls and ringlets. 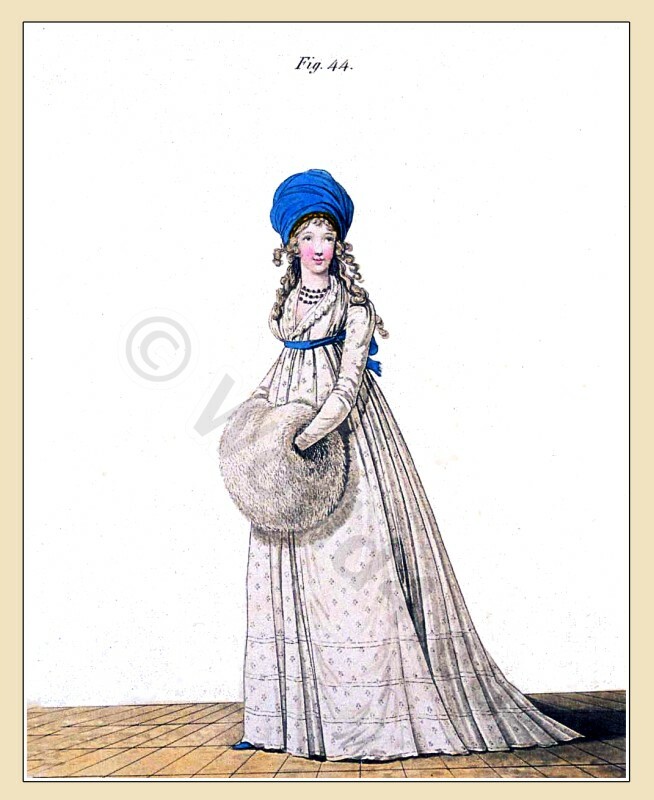 Turban of light blue crape; bandeau of gold foil, set with diamonds and pearls; the hind hair turned up, mixed with the turban, and the ends returned in ringlets. Jacket and petticoat of sprig muslin; four plaits across the petticoat; the jacket trimmed on the back with lace; short sleeves. Small handkerchief, trimmed with lace. Sash of blue satin riband. Three strings of pearls round the neck. Pearl ear-rings. Blue satin shoes. White gloves. Swan down muff. This entry was posted in 1795, 18th Century, England, Gallery of Fashion, Georgian period, Regency period and tagged England Georgian Era Fashion, Neoclassical dresses, Nikolaus von Heideloff, Regency period on 6/12/13 by world4.